It isn't his fault. He is blameless. He is faultless. If you are looking for a villain, it isn't he. You can blame the offense. You can blame the defense. You can blame the urgency, or the precision, or the battle-plan. But you cannot blame goaltender Andrei Vasilevskiy, say the members of the Tampa Bay Lightning. Oh, part of this is the time-honored tradition that hockey players rarely blame their goaltender, because said goaltender is the key to getting out of whatever sized hole (think crater) the team finds itself in. And so it is that no fingers point toward Vasilevskiy, who has given up 10 goals in five periods of play this series. Vasilevskiy ranks just ninth in save percentage in the playoffs (of 21 goalies) and just 12th in goals-against, but the team swears it's not his fault. 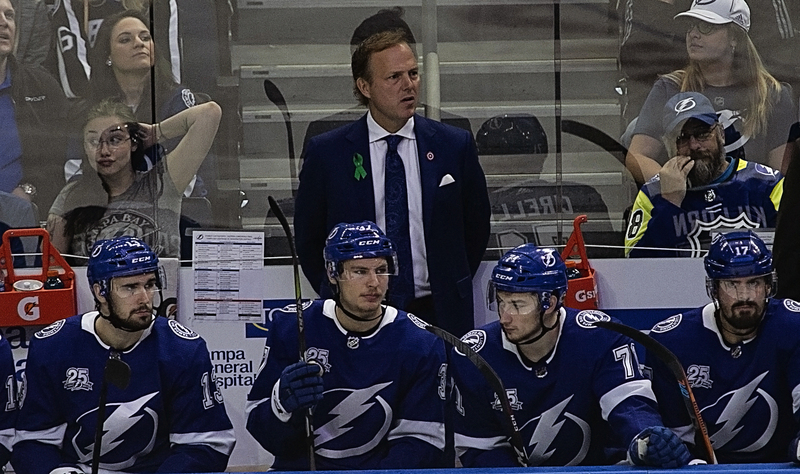 "He's been the rock of this team all year," Lightning coach Jon Cooper said. "To be honest, I don't think it matters who's in goal right now, some of the chances we've been giving them and the number of chances. You play defense as a team, and your goalie is the last line of defense, and when you stack them all up, I'm taking Vasilevskiy. But regardless who's in the net, you're going to give up these chances, it makes it hard on your goaltender, and believe me, he's the last guy we're pointing fingers at." It is Vasilevskiy's first season of being in charge of the Bolts' net. This year, he is a Vezina finalist after a regular season in which he won 44 games. 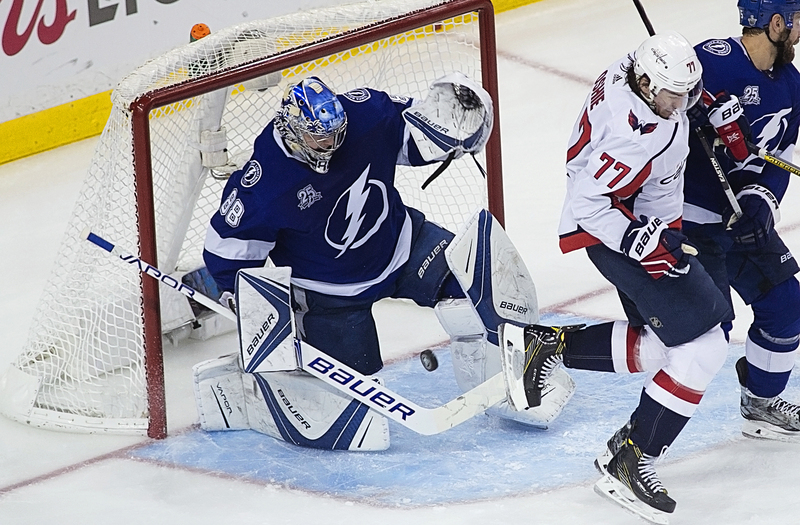 "He's a Vezina finalist for a reason," Lightning defenseman Dan Girardi said. "We're not doing the best job in front of him as we have been the last two series. There is a lot on us to help him out back there. It's not him at all. I think it's just how we are defending in front of him. They're getting a lot of grade A looks and a lot of odd-man rushes. He can't save them all. We need to be there for him for sure." Said forward Braydon Point: he's been awesome for us all year. He's made a lot of good saves in this series too, some big-time saves. He's been playing great and we’ve just got to do a better job in front of him." Victor Hedman said that Vasilevskiy has the ability to bounce back. "He's proven that all year," Hedman said. "He's obviously been the most consistent, best player this whole season. So we've got to do a better job in front of him clearing pucks and turnovers. It's tough for a goalie when the puck's going east to west and you've got to recover. "But he's one of those guys, his competition level is so high. He puts a lot of pressure on himself, and you want that in a goalie. We've talked after the game, talked in between periods that we're a good team. We're here for a reason. We believe in ourselves and in this group. We've got to go out there and win games on the road, and we've done that in the playoffs and we've got to do it again. One theory is that Vasilevskiy may be putting too much pressure on himself. "I think any goalie puts pressure on themselves that they're stopping the puck to help their team win," Girardi said. "Like I said, we have to do a better job in front of him to make his job easier." Said Hedman: "No, I think he's one of those guys that can put this behind him and learn from it. Vas is a world-class goaltender, and we have to help him make the stops. So it's a matter of us making it easier on him. Don't give up too many opportunities. They have a lot of skill on that team and they're going to put the puck in the net. It's about eliminating those chances and trying to play more in their zone." Hedman acknowledged that it doesn't feel like the same team. "No, obviously not," Hedman said. "We are giving up too many scoring chances. Odd-man rushes. We've got to give their team credit too. They're obviously finding ways to create those opportunities. For us, it's about looking at ourselves, looking at our game plan, and looking at our video of what we can change to eliminate that. That's what we're going to do. We've got to bounce back tomorrow. It's the biggest game of the year tomorrow, go down 3-0 or cut the lead in half. We're in this position now and nothing can change, all we can do is focus on (the next game). Cooper talked about what his team had to do better. "Well, a couple of things," he said. "One, we're probably not following our structure the way we have in the previous two series. That's one thing. The second thing is execution. When you get chances to make plays -- and our team has an ability to make plays, and we're not. It's either the puck is in the skates or it's too far ahead or you're putting it somewhere where they can't handle it. It's just unlike us. "It happens. Nobody plays the perfect game -- nobody goes 82-0. Nobody goes 16-0 in the Playoffs. It's just heightened when you're at this time of year and at this time. Is it discouraging that this has happened to us right now? There's no question. But come on, boys, let's regroup and do what we do best and what we've done together this year, and we'll be okay." Next post: Wendle drives in winning run late against K.C.